Too much beauty was Richard T. Foster’s problem. Standing on the six-acre site of his future home in Wilton, he could look in almost any direction and see a beautiful view. Which way to face the house? Which view to concentrate on? Fortunately, Foster is an architect. And an ingenious one. His solution: Build a rotating house and take advantage of all the views. And that’s what he did. 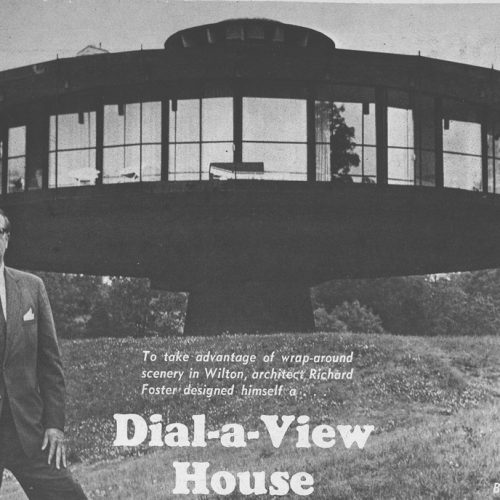 His futuristic carousel house now sits — and turns — on a pedestal in a country glen on Wilton’s Olmstead Road, looking very much like a flying saucer that’s just landed and whose crew is about to emerge to inspect the funny-looking ranches and colonials nearby. 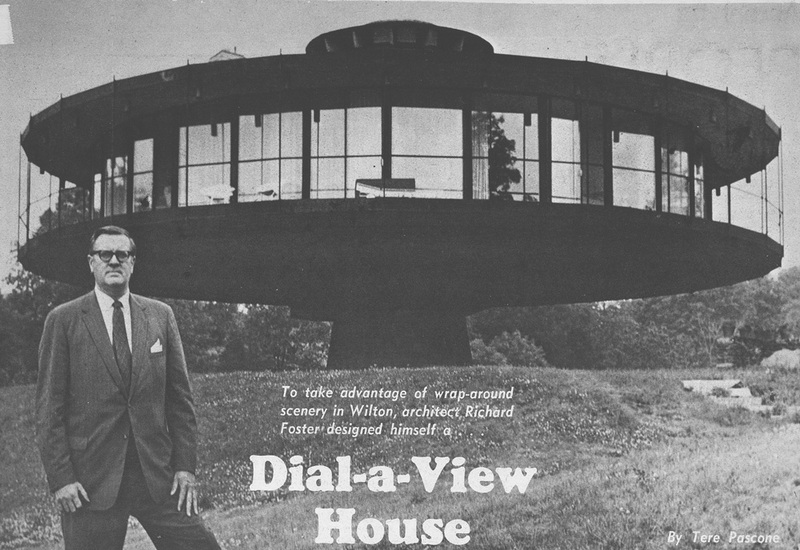 The nine-room home, 72 feet in diameter, rotates in either direction around its stationary core. The rate can be varied so a full revolution will take anywhere from 48 minutes to two hours. At the fastest speed, a person sitting on the sundeck rail moves at five feet a minute. 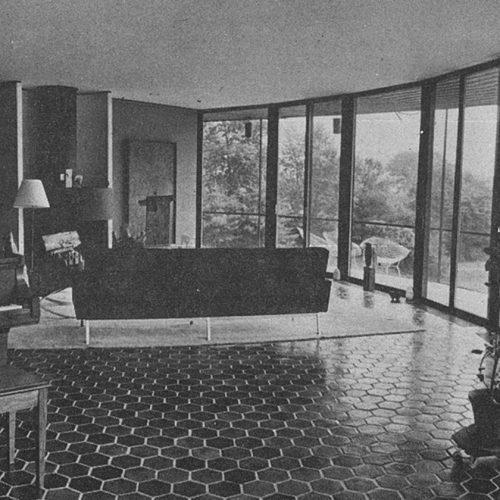 From inside the house, however, the movement is not perceptible unless you look at a fixed object in the landscape. Foster or his wife, Eleanor, or their three sons (who range from high school to medical school age) can walk over to a small control box on the core stairway and dial any room to any view as easily as turning a TV rotor antenna. Their choices are many. On the north is a pine forest. On the east, rolling farmlands and a small fish pond. On the south, the courtyard entrance. On the west, broad Pope’s Pond. From her kitchen window, Mrs. Foster may watch the sunrise as she makes breakfast or the sunset as she prepares dinner. When she’s expecting guests, she can dial herself around to t h e courtyard so she’ll spot their arrival. Foster, sitting in his den in the summer, can turn his house to catch a light breeze or put shade in the room.On an autumn evening, he can give himself a box seat to the rise of a plump harvest moon. The carousel house, which cost well over $100,000, is a marvel of engineering. Unlike the restaurants that rotate on towers, such as the one at the Seattle World’s Fair grounds, it takes its plumbing, electricity and other utilities along for the ride. To solve the many problems this posed, Foster had to turn to industry for answers. 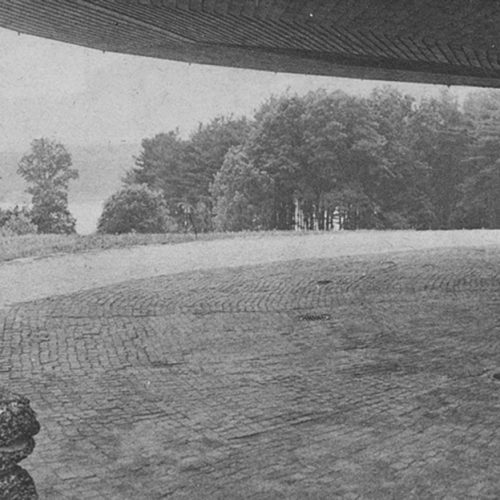 The 14-foot ball bearing on which the house’s 25-ton, concrete turn- table rides was originally designed for a warship’s gun turret. Water enters the house under- ground, goes up a vertical pipe in the stationary service core and flows into the plumbing via a swivel valve designed for oil drilling and loading tankers. Electricity feeds from a fixed trolley on the stationary pedestal to a circular power track under the house. The sewage system, of Foster’s own design, is more complicated. Pipes from the house lead down to a trough cover fixed to the inside perimeter of the rotating turntable. The trough itself is in the stationary pedestal underneath and contains flowing water. The cover glides over it without touching, but has two walls which drop down into the water and seal off odors. The trough is pitched to four drains emptying into a septic field. Heating is contained entirely in the rotating section. Fuel for the oil-fired hot-water system is in two 250 – gallon tanks in the attic. Radiators are recessed in the stationary pedestal, which is 10 feet in diameter and clad, like the roof, in weathered gray shingles. You enter and climb 22 oak steps that spiral up around the core pipe to the main landing. 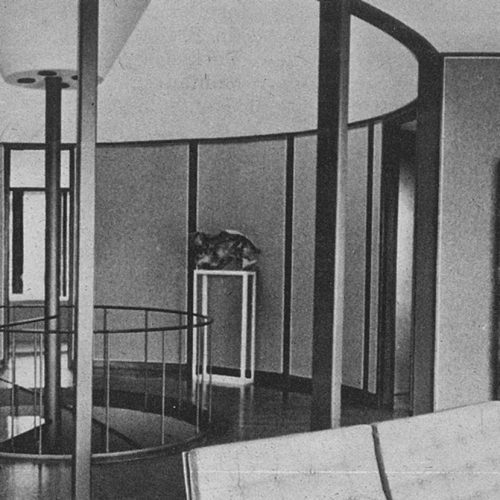 The landing is a circular hall with a wide opening to the living room (providing orientation when the house revolves) and doorways to other rooms. maintains, without upkeep, a warm brown surface. Outside lights are set in the porch’s overhang, 36 of them in downlight cans, all on a dimmer to make the house sparkle at night or glow faintly.. Similar lights are recessed in the ground, shooting light up against the underside of the house, and lighting the cobbledterrace and entrance indirectly. Foster, who works in New York, formerly lived in a house in Wilton not far from his present home.